– There’s only one place we can start this week, and that would be in Madrid…with Getafe 0-1 Atlético! The Primera División champs secured all three points away in this ill-tempered derby clash, as Mario Mandžukić netted off – what else – a set piece just before halftime. That goal was the Rojiblancos’ 15th of the year and 11th from a set piece. 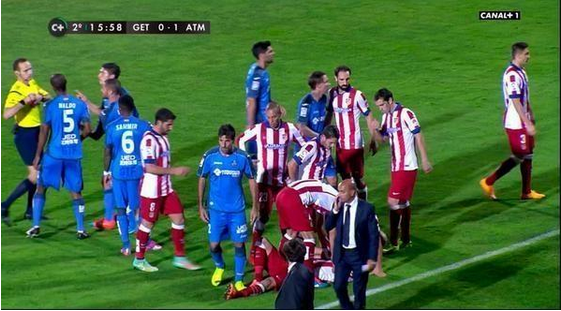 In the second half, Getafe captain Alexis was sent off for smacking Mandžukić across the face, and in the ensuing scuffle, Miranda observed Juan Rodríguez “standing” on the fallen Mandžukić’s leg and got into the book for shoving him out of the way. Nothing gets past Inspector Miranda. – There’s just no stopping Unai Emery’s Sevilla train right now. The Andalusians rallied late to defeat Villarreal 2-1. The Yellow Submarine looked to have won through substitute Luciano Vietto’s 79th minute goal, but the hosts had other ideas. A cross into the area two minutes from time wreaked havoc on the Villarreal defense, and Denis Suárez popped up to poke home the equalizer. And in stoppage time, Carlos Bacca banged in a (deserved) penalty – his seventh goal in nine games – to leave Marcelino and his men stunned. Sevilla have come a looooong way since the UEFA Super Cup. – The pressure was on at Mestalla on Saturday night. With new owner Peter Lim in the house and a 3-0 pasting at Deportivo still fresh in the memory, coach Nuno’s troops were not lacking in motivation against Elche. Los Che breezed past the El che, 3-1. The hosts were up 2-0 inside 20 minutes, as Shkodran Mustafi and Dani Parejo found the back of the net via corners, and a Lombán own goal (also from a set piece) completed Valencia’s scoring on the night. 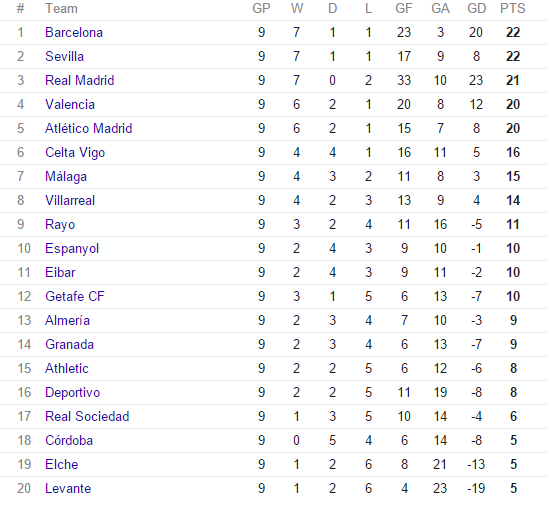 Sevilla’s win the next day prevented Valencia from moving into second, but they’ll no doubt be happy with fourth place. – Y’ALL. ATHLETIC CLUB BILBAO WON. THIS IS NOT A DRILL. The much-maligned Basque club went away to Almería and claimed a 1-0 victory. This was a sloppy affair, as the two sides managed only four shots on target between them (Almería had three of them) and neither side completed 70% of their passes. So it makes sense that this is how the game’s only goal would be scored. Aside from scoring that goal, Athletic center-back Xabier Etxeita won five aerial duels and recorded five clearances. Ander Iturraspe also had a nice bounce-back performance, as he won four aerials, accrued three interceptions, and notched two tackles. -Oh yeah, a Clásico happened on Saturday. Ahmad talked about that in detail here. Other scores: Celta Vigo 3-0 Levante, Córdoba 1-1 Real Sociedad, Eibar 1-1 Granada, Málaga 4-0 Rayo, Espanyol 0-0 Deportivo. This entry was posted in La Liga, Roundups and tagged Atlético Madrid, barcelona, cristiano ronaldo, Karim Benzema, La Liga, lionel messi, Luis Enrique, luis suarez, real madrid, Sevilla, Valencia. Bookmark the permalink.